Situated 45km South of Bordeaux on the left bank of the Garonne river, Chateau Guiraud covers 128 hectares in the villages of Sauternes and is known for its exceptional botrytisized sweet wines made from Semillon and Sauvignon Blanc grapes. The wines are aged in barrel for 24 months before bottling. They are aromatic, lusciously sweet and lively making them the ideal accompaniment to blue cheese and fruit based desserts. 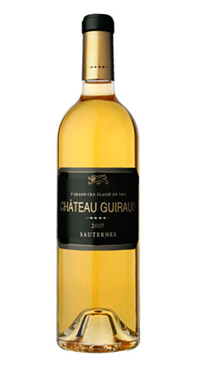 Known and loved for its Premier Grand Cru Sauternes, Château Guiraud displays another side of the vineyards potential with this dry white made from Sauvignon Blanc (70%) and Sémillon (30%) from vines aged 15 years on average. Fruity and floral, it reveals a lively mouth and flavours of acacia and white fruits. Aged in sauternes barrels. A fresh white, with a creamy edge to the peach, melon and salted butter notes. The stylish finish lets a hint of macadamia nut chime in.